Alan Gee, Glanbia CountyLife Mountmellick helping local customer, suckler farmer Mary McEvoy from Rosenallis Co. Laois. 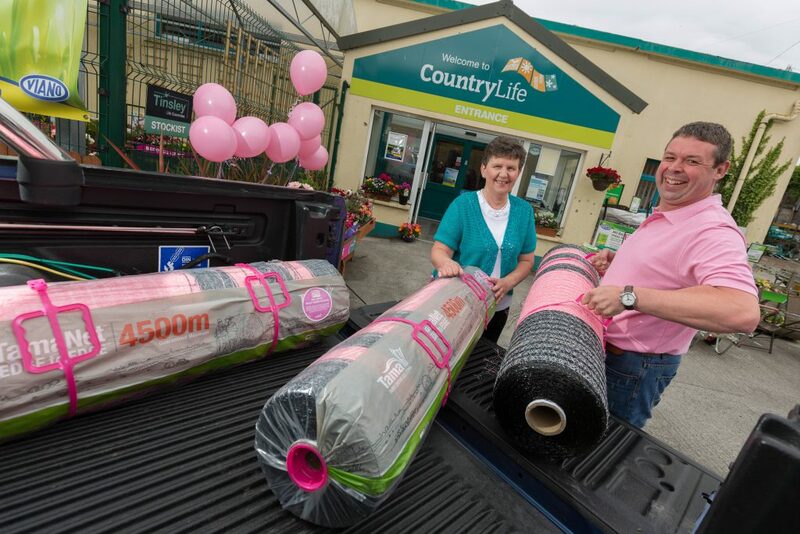 Farmers around Ireland are being encouraged to go pink this summer in aid of breast cancer awareness with pink netwrap supplied by Glanbia Agribusiness. Glanbia has teamed up with Tama, the crop packaging manufacturer, to support breast cancer research, education and awareness in rural communities. As well as selling a limited edition pink and black netwrap, the companies are making a donation for every Tama Edge to Edge netwrap sold this summer to Breast Cancer Ireland. Commenting on the initiative, CEO of Breast Cancer Ireland Aisling Hurley, said Breast Cancer Ireland is delighted to partner with Glanbia Agribusiness and Tama and hopes the campaign will raise awareness of breast cancer in farming communities. 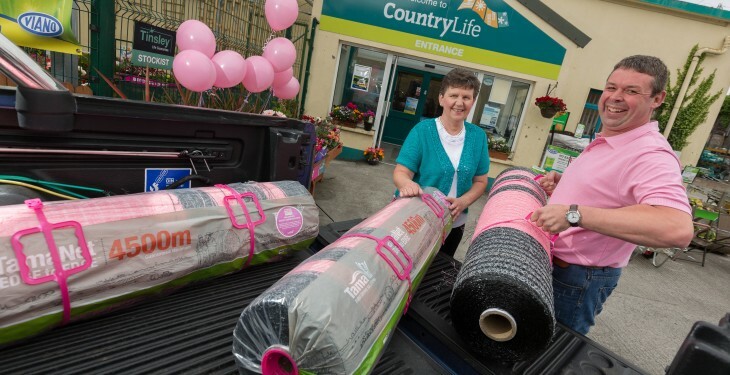 A limited quantity of TamaNet Edge to Edge 4500m netwrap, which holds together round bales of hay, silage and straw has been specially manufactured in pink for this campaign. The rolls can be purchased across all Glanbia Agribusiness and CountryLife branches. Michael Murphy, Sales Manager with Tama UAT, said that women have integral roles in the farming and contracting business. Alan Gee branch manager with Glanbia Agribusiness in Mountmellick, Co. Laois and a cancer survivor himself said awareness and early diagnosis is the most important thing. James Byrne, Marketing Manager at Glanbia Agribusiness, said Glanbia is delighted to be supporting breast cancer research and raising money for such a good cause.